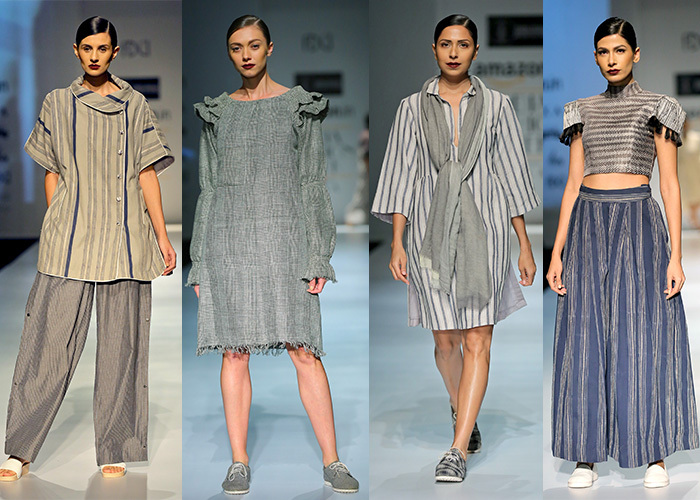 Anju Modi’s sustainable line had traditional ensembles like kurtas and asymmetric jackets layered with saris in washed-out tones of ivory, mustard yellow and indigo. 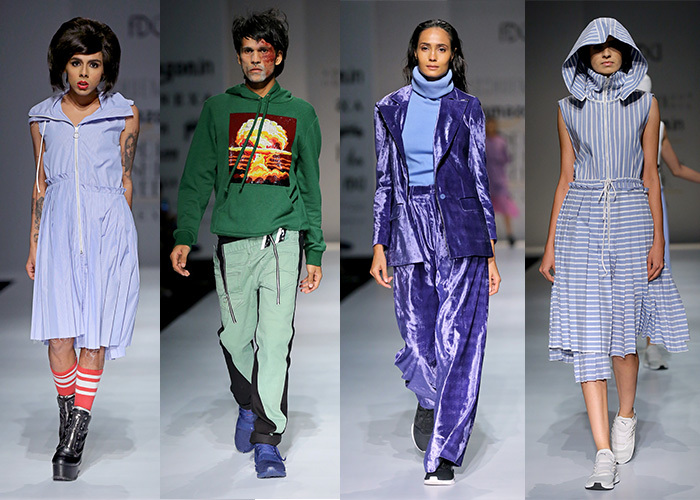 Inspired by the Swadeshi movement, the collection focused on stripes and checkered patterns that were skillfully handcrafted to keep with the present-day sartorial relevance. Inspired by Nobuyoshi Araki’s affinity for lush flower arrangements, the duo presented a glamourous resort-wear line comprising of relaxed comfort wear like capes and robes, paired with shorts, palazzos, classic gowns and flare skirts. Quirky matching accessories like tote bags and slip-on mules created a strong statement. We are already dreaming of our beach wedding! 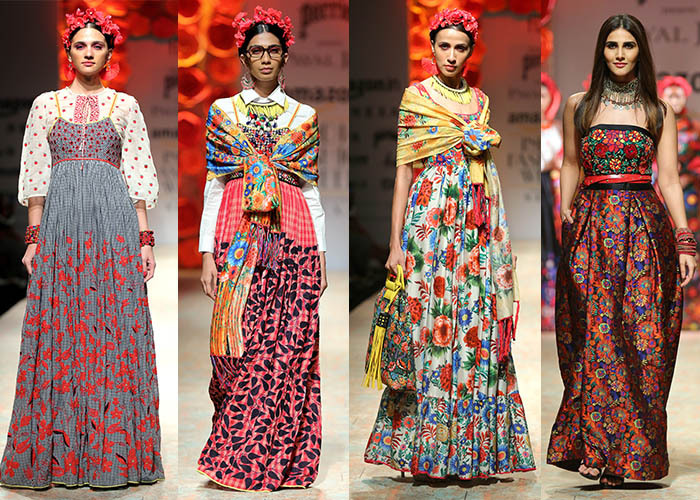 The designer marked her 25th year in the industry with bohemian ensembles blatantly inspired by Frida Kahlo. 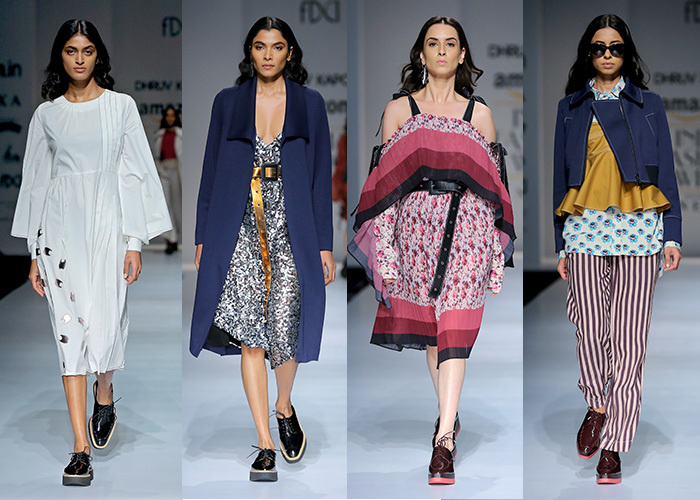 Think maxi dresses, full skirts and detailed shirts paired with long jackets. Floral prints were largely evident and extended themselves to embroideries seen on stoles, and other accessories. Designers Shyma Shetty & Pranav Misra yet again displayed a collection of avant-garde silhouettes depicting a fearless aesthetic. Upcycled denim, deconstructed dresses and a whole lot of texture play was seen in separates that set new standards for luxe athleisure. Versatility and functionality were brought forward in this collection. An effortless blend of varied silhouettes was visible and could be worn in more ways than one. Statement sleeves and sequined separates paired with sheer layers caught our fancy. 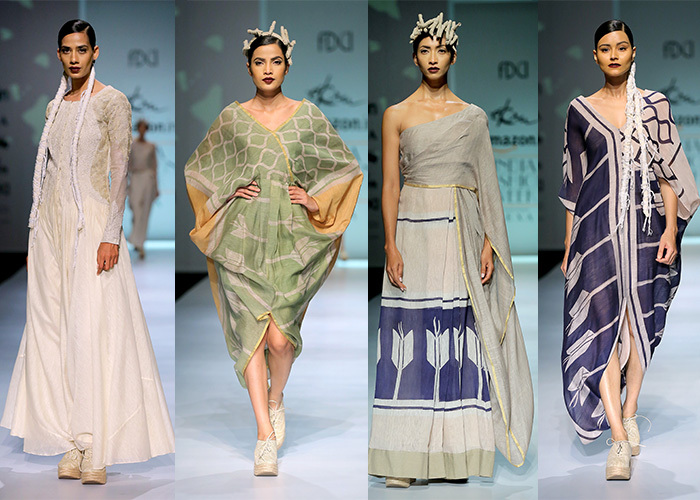 Madhu Jain displayed a collection that was all about festive glamour. The designer, known for having worked with heritage weaves and brand-new textiles, created a line that exhibited cultural richness. 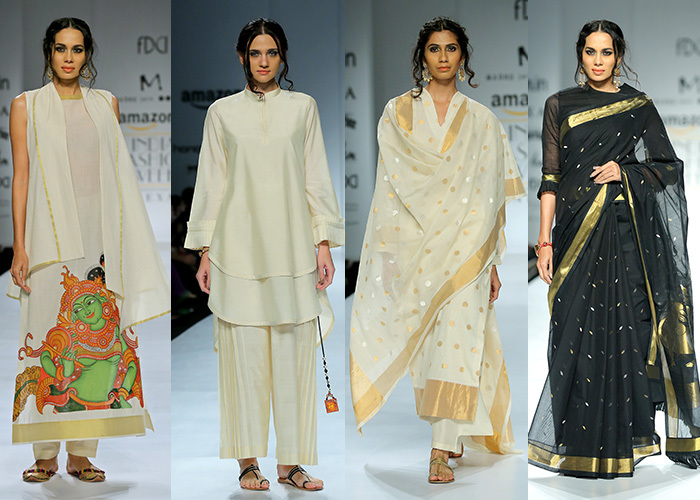 From hand-painted dupattas inspired by frescoes of temples in Kerala to tribal motifs weaved in traditional Jamdani tradition, the versatile collection in organic handloom cotton was rendered in elegant colours like black, ivory and gold. A subtle collection embodying feminine styles was the highlight of the show. Techniques like hand applique and intricate embroideries outlined ensembles that were made in varied shades of pastel yellow. 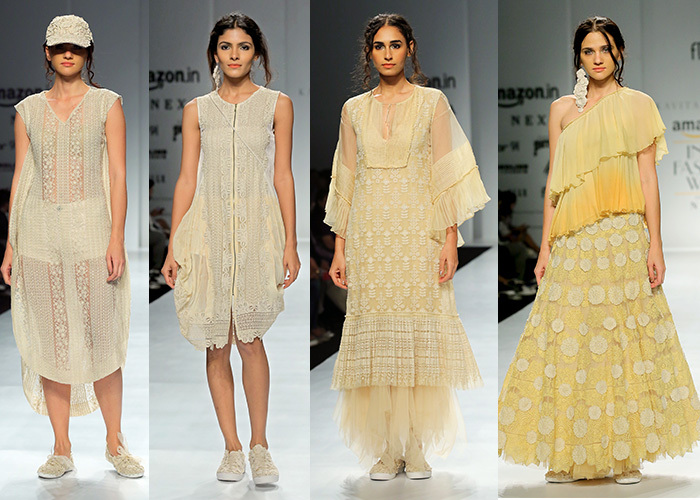 From ruffle skirts to delicate sheer capes and threadwork lehengas, the silhouettes were perfect for a summer wedding. Barcode stripes were the primary inspiration behind this collection that saw a mix of slip dresses, trench coats, and jumpsuits paired with leather blouses and crop shirts. The colour palette was mainly hues of black, white and grey with hints of red. 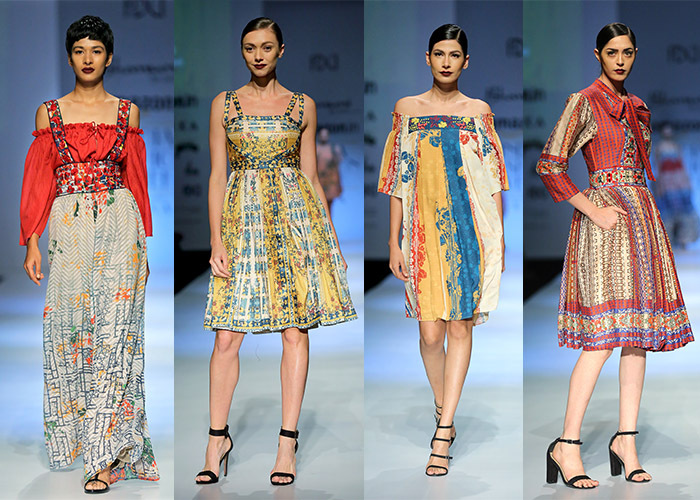 A clash of prints in flowy silhouettes was the focal point of Bhanuni’s collection that exuded a bohemian vibe. Victorian styles like A-line skirts, maxi dresses, shirts with puff sleeves and wide-legged trousers made an appearance as well. 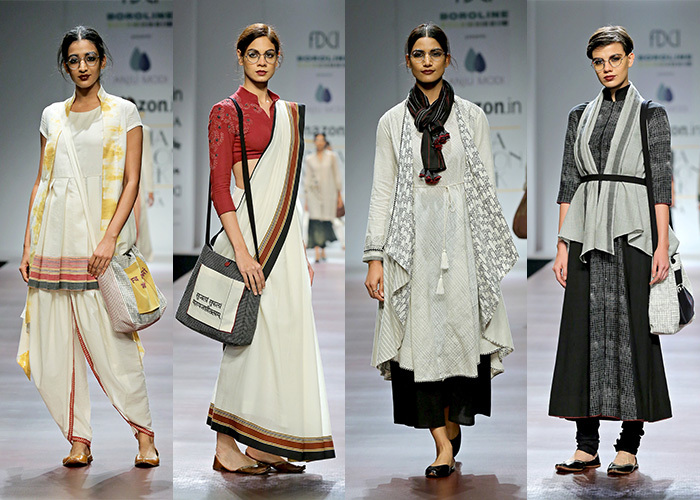 The collection was a mix of supple and airy silhouettes in lightweight handloom cotton enhanced with detailed textures and varied printing techniques. Inspired by the elements of nature like falling leaves and tree trunks, the duo presented ensembles that were unique in their own way.